British scientists have begun work on a vaccine against the H1N1 swine flu virus. Their efforts are under way at the National Institute for Biological Standards and Control (NIBSC) in Hertfordshire. The NIBSC is one of a small group of influenza centres around the world which will create a seed vaccine strain which could then be grown in bulk by manufacturers. 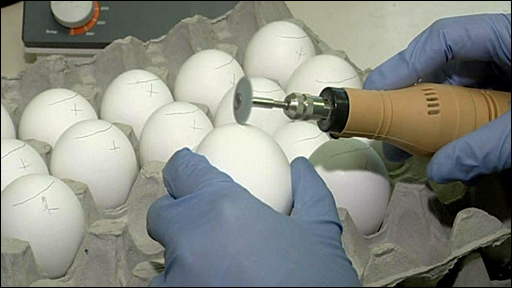 Its scientists need a steady hand to drill a hole in a hen's egg. For that is the first step in the creation of a vaccine against the swine flu virus. Scientists at NIBSC, which is part of the Health Protection Agency, say eggs are ideal for growing up flu viruses. "They are like virus production factories," its principal scientist Dr John Wood explained. "Eggs have been used for decades to make flu vaccines. It's an old technology but it works very well." I was allowed into one of the containment labs which will be used to make the vaccine but not where the live virus is being used. This is not because of infection but because I might contaminate the vaccine production process. 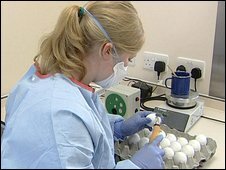 It involves scientists painstakingly injecting a small amount of virus into each egg which will then be incubated over the weekend. By Monday, they should have enough virus to begin the next stage. Two different techniques are being used. First, "reverse genetics", where scientists take the H and the N surface proteins from the H1N1 virus and mix them with a laboratory virus known as PR8. This creates a harmless hybrid virus which can be used for the vaccine. The second technique involves injecting both the H1N1 and PR8 viruses into eggs and allowing the hybrid strain to be created through a natural re-assortment of their genes. 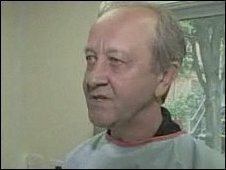 The vaccine will work by tricking the immune system into thinking it has been infected with the H1N1 swine flu virus so that it creates antibodies against it. Then, if subsequently exposed to the virus, the immune system will destroy the invader before it can cause illness. The first seed strain of H1N1 swine flu vaccine should be ready in three to four weeks. It will then take another four or five months for vaccine manufacturers to produce the vaccine in bulk. On Wednesday, when the WHO raised the threat level to five - one short of a pandemic, its director general stopped short of asking vaccine manufacturers to switch to an H1N1 strain. Dr Margaret Chan said this was because it was not yet clear how severe the virus would be. "It will be an extremely difficult decision for the World Health Organisation and governments to make," said Dr Wood. "Manufacturers are halfway through producing their normal vaccine to combat winter flu. "If they are asked to stop doing that it means there will be shortages of the normal seasonal vaccine and vulnerable people could be susceptible if there was an epidemic of ordinary flu this winter". The WHO has a matter of weeks in which to make that decision if it does not want to lose valuable time. No-one should expect a swine flu vaccine to be available before the Autumn. In fact most of us will have to wait a lot longer. Around 300 million doses of seasonal flu vaccine are produced globally each year. The vaccine includes three different strains of human flu so each dose takes three eggs to produce. If manufacturers switched to producing a single pandemic strain vaccine, they might feasibly triple the number of doses to around 900 million. We do not know how well the virus will grow in eggs or how much antigen will be needed to create an effective vaccine. It may require two injections to provide adequate immunity. With a world population of more than six billion, there clearly will not be enough to go round and the disease will hit poorer countries hardest because they cannot afford to buy the vaccines. The UK government has contracts with two manufacturers to produce 120 million doses of pandemic vaccine - enough for two doses per Briton, if required. But unless you are a front-line healthcare worker or someone involved in an essential service, do not be surprised if you are not among the first to receive it. If a pandemic is declared and vaccine production begun then most of us are likely to have to wait until well into next year before we are offered it. That is why it is so important to try to prevent an epidemic in Britain now. That would buy us valuable time in which to create a vaccine.